Tesla reveals new details on pricing and product options for homeowners. We've been waiting on pricing details for Tesla's solar roof since last year. They're finally available. 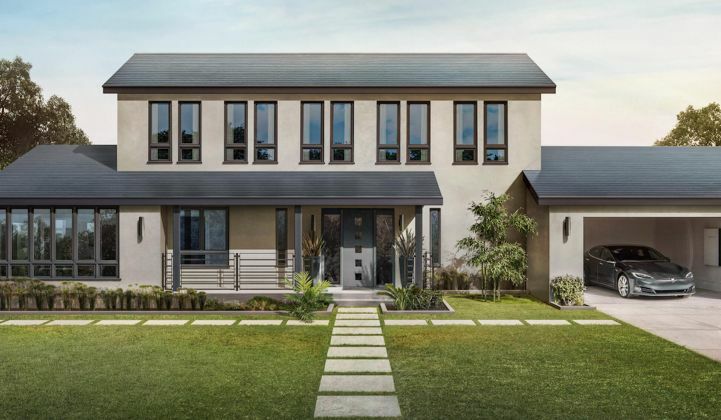 Tesla officially started taking orders for its highly anticipated solar roofing system today. Since the public launch of the product last fall, Elon Musk has been dropping small details about warranties and performance -- but he's said nothing about how much consumers can expect to pay. Tesla now has a website that allows homeowners to figure out how much it will cost them. Here are the most important details that we know so far. Musk: "It's a better product at a slightly better price"
According to Tesla, the product will cost $21.85 per square foot for an average American home -- making it competitive with standard tile, metal or slate roofs. You can read more about Tesla's assumptions here. Speaking on a briefing call with reporters, Musk said a solar roof covering 40 percent of the average-sized American home would generate 10 percent to 20 percent more electricity than a standard solar system. "It's a better product at a slightly better price," said Musk, comparing the product to conventional roofs. "It's the most affordable roof you can buy," said Peter Rive, SolarCity's chief technology officer, on the call. 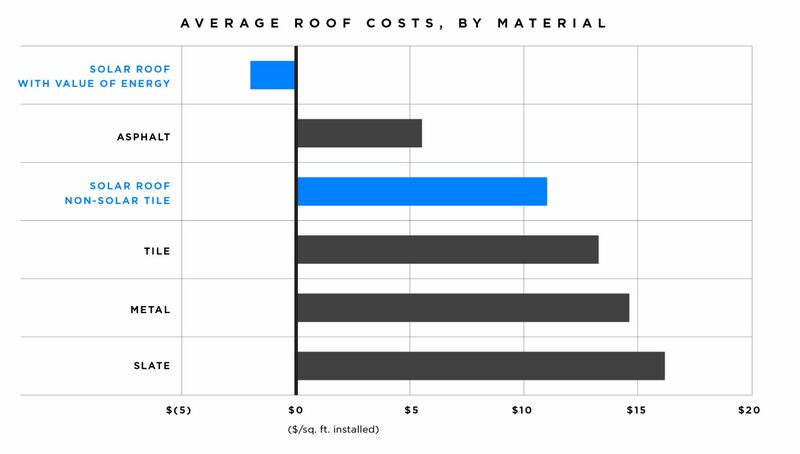 In a blog post, Tesla provided a cost comparison to other roofing options: "As shown in the graph below, the cost of our non-solar tiles is comparable to regular roofing tiles. Although the cost of our solar tiles is more expensive upfront, it can be more than offset by the value of energy the tiles produce. In many cases, the reduction in a home’s electricity bill over time will be greater than the cost of the roof." What is the product, exactly? It's a fully integrated system -- tempered glass solar tiles, power electronics, and an "all-inclusive contract" for financing and maintenance. Oh, and the warranty is "infinity." Really. "We offer the best warranty in the industry -- the lifetime of your house, or infinity, whichever comes first," wrote the company. Musk said the roofing contract would be structured "much like we sell cars." But here's an important caveat about the all-inclusive nature of the contract: "The estimated cost of your Solar Roof includes materials, installation, and the removal of your old roof. Taxes, permit fees and additional construction costs such as significant structural upgrades, gutter replacement, or skylight replacements are not included." According to Tesla, the roof is "three times as strong as standard roofing tiles" and one-third the weight of a normal tile. As Musk hinted on Twitter earlier this morning, Tesla will offer gray smooth glass tiles and black textured glass tiles. The slate glass and Tuscan tiles will be available in six to nine months. Musk said that Tesla expects consumers to cover 40 percent of their roof with solar tiles on average. The calculator allows customers to price out their own roof with up to 70 percent solar tiles. If you price out your home, Tesla will encourage you to add a Powerwall. That'll add another $7,000 to the system. "We recommend that every Solar Roof be installed with a Powerwall battery to enable you to use more of the solar power your roof produces and keep your home running during a grid outage. In states that do not have Net Energy Metering policies, we estimate and recommend a number of Powerwalls that will enable you to realize the full benefit of the energy your Solar Roof produces." Tesla plans to make the entire system in Buffalo, New York, with cells made from Panasonic. Peter Rive, the CTO of SolarCity, said the efficiency of the solar roof tile was equivalent to a standard solar PV module. JB Straubel, the chief technology officer at Tesla, said it is "a very different approach to manufacturing solar modules." He added that the solar division had "leaned heavily" on the Tesla team -- particularly when it came to developing electrical connectors. Musk said the strong tempered glass makes it easier to ship than conventional tiles. And because the product is one-third the weight, the cost of shipment is also much lower. "We save on logistics and breakage," he said. It'll cost you $1,000 to reserve a system. Installations will occur on a first-come, first-served basis. "We’re going to essentially custom-design the solar roof system for a homeowner," said Rive about the systems. An important note: The product initially will only be available to California homeowners. Tesla will expand to other states in the future, depending on demand. "Installations will start in June, beginning with California and rolling out to additional markets over time. When Solar Roof is rolled out in a particular market, Solar Roof customers will be installed based on when their order was placed," wrote Tesla. Installations will begin this summer. More aesthetically appealing options will be released in 2018. We'll have much more analysis on the value to consumers -- and how Tesla plans to integrate the product into its sales model -- in future coverage.